Income Tax, a Norman Rockwell painting, appeared on the cover of The Saturday Evening Post published March 17, 1945. This is another favorite of Rockwell collectors, a classic enduring image of the world Rockwell painted. An alternate title for this painting is It's Income Tax Time Again. This painting was Rockwell's 227th overall out of 322 total paintings that were published on the cover of the Saturday Evening Post. Rockwell's career with the Post spanned 47 years, from his first cover illustration, Boy With Baby Carriage in 1916 to his last, Portrait of John F. Kennedy, in 1963. This was also the first cover for The Post in 1945. In 1945, there were ten Norman Rockwell Saturday Evening Post covers published. The original oil on canvas painting, 22 x 20 inches or 56 x 51 cm, is part of a private collection. One study also appears in the Norman Rockwell Catalogue on pages 159. 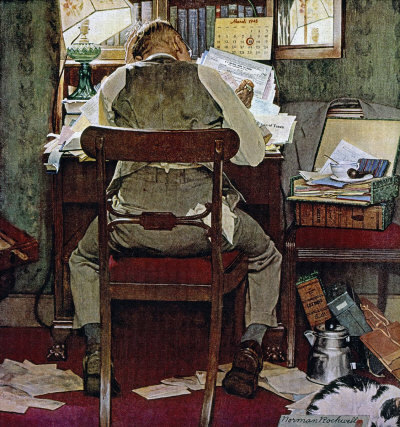 In this painting, Norman Rockwell shows us the dilemma of millions of Americans. Always painting topical, relevant subjects, Rockwell tackled a sensitive issue in this painting. He also probably did a service to tax collectors everywhere. In 1945, the deadline for filing the income tax return for US citizens was March 15. It was later, in 1954, pushed back to April 15. Here we see an embattled man trying to manage his mountain of paper. Taming that mountain before the deadline may be problematic. He has brewed a big pot of coffee, but can find no room on his desk to set it. So he has put it on the floor. Income Tax was only one of 322 Norman Rockwell Saturday Evening Post covers; Here is the list of Norman Rockwell Saturday Evening Post cover illustrations. His cup and saucer, as well as his pipe can be seen in the chair next to the desk, sitting atop another pile of paper. Even though he is sitting in a chair, he looks as if he is really straining and working hard. His deadline date is circled on the calendar. Will he make it? This painting graced the cover of the Post two days after the deadline. No doubt most of the readers could relate to this painting. Do You Have A Great Story, Opinion Or Contribution About Income Tax?